I was a little skeptical buying this washing machine, but the majority of reviews that I could find were mostly positive, so I decided to give it a try...and I am glad I did. It is true that you won't be washing blankets or winter coats in this machine, it couldn't handle such bulky items, but I find it perfectly adequate for my apartment. I do a couple small loads a week and it works perfectly for that. I can fit 2 of my heavy duty work uniforms and it cleans them very well. I used to do one large load of underwear and socks a week. Now I do 2 smaller loads of those in this machine. 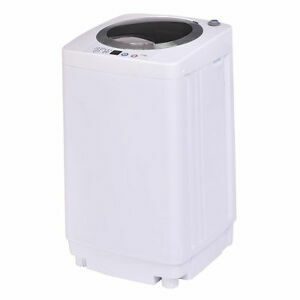 It is whisper quiet and uses far less water than a standard sized machine. I am satisfied with this purchase and would recommend it to someone who doesn't have a lot of laundry to do on a weekly basis. This washer has been awesome! I've used it several times and it cleans everything I've thrown at it. It's small, but can handle queen sheets just fine. The hose connection has pipe threading and does not attach straight to my kitchen sink, but if you get a kitchen sink to garden hose adapter along with a connector for the pipe thread to garden hose thread, it will work. You can add an additional hose if you wish. The adapter and connector were about $4 each. It's worth it and works well. Handles day to day laundry very well. Will not handle blankets or winter coats but everyday laundry it does well. Once set up, the options are small medium or large water level and soak, wash, rinse and spin selections. Select what you want and the machine does the rest.